With many enterprise platforms developers have various goals for their software, such as high performance, throughput, storage, or tackling the main issue of the day. It’s one thing to write software on one type of machine then deploy it to the datacenter, but it’s another to write code on a similar machine to what it will end up on. Most big server platforms will, in one form or another, have an OEM that will offer the equivalent of a ‘development tower’, enabling users to write code with the hardware at the desk. This time, GIGABYTE has developed an EPYC Tower, for both code development and small/medium enterprise deployments. The W291-Z00, a name that rolls right off the tongue, is a single socket EPYC platform built around one of GIGABYTE’s motherboards and can fit up to 32 cores, 64 threads, 1 TB of DRAM (eight slots), and four high-powered GPUs. The idea here is that this can be built as a beast if needed, and the chassis uses air baffles to support passive GPUs or accelerators as well. There is the equivalent of nine PCIe slots in the chassis, allowing accelerators larger than dual-slot to be supported even on the lowest PCIe slot. These are powered by dual redundant 1600W 80Plus Platinum-rated power supplies. For storage, there are four hot-swappable bays on the front that support 3.5-inch and 2.5-inch SATA or SAS drives, and there is also an M.2 slot on the motherboard. Additional storage is supported through riser cards on the PCIe slots, or through the four mini-SAS ports for a total of 16 drives. Management is from the ASpeed AST2500 BMC, and each of the four fans can be adjusted by GIGABYTE’s console management UI. Networking is with two Intel I210-AT gigabit networking ports, plus another for the BMC. GIGABYTE’s target markets for the W291-Z00 include small offices, small/medium enterprise, and universities, or anyone looking at simulation, machine learning, or AI/HPC workloads. 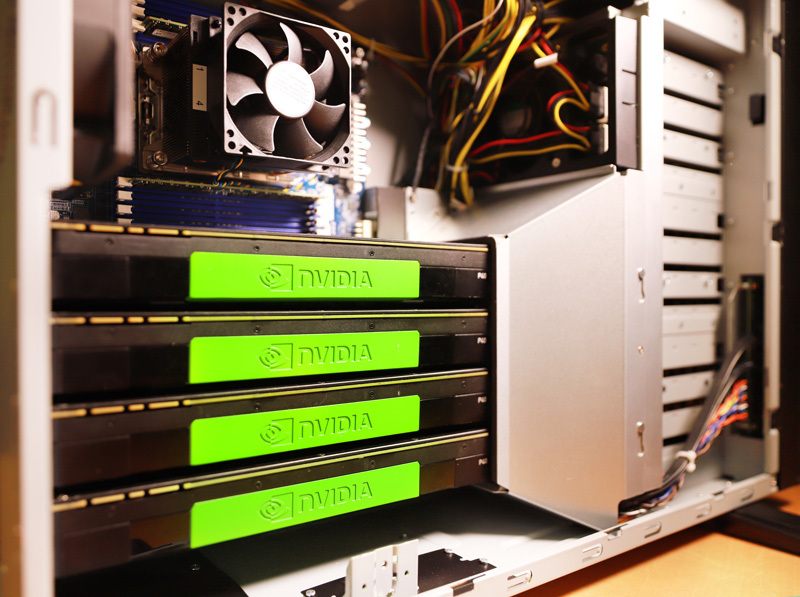 With GPUs, the company is also targeting accelerated AI workloads, as well as graphical CAD and rending workloads. While the product is available from today, as this product is from GIGABYTE’s server team, interested parties will have to contact their local distribution partner for pricing.